When it comes to my locks, the thirst is real. Both pun & no pun intended. But, it's a picky kinda thirst - kinda like that friend who's desperate to find love, yet has a strict height, weight and eye color requirement. My requirement is sulfate-free hair products. I've been sulfate-free for quite a few years after diagnosing myself with a sulfate allergy, so I'm always scanning the shelves in search of new sulfate & chemical-free products. Side note: It ain't easy. And then came the discovery of HASK: an actual knight & shining armor. HASK Beauty is a unique collection of hair care products that blend exotic oils, quality ingredients, and luxurious fragrances into shampoos, conditioners, shine oils and deep conditioners. The best part? These unique blends include ingredients such as Argan Oil, Macadamia Oil, Monoi Oil and Keratin Protein. What else could one need?! Well- the second best part: Not only are all HASK shampoo and conditioners free of sulfates, but they're free of parabens, drying alcohols, phthalates, gluten and artificial colors as well. I took the honor of trying out HASK's entire Argan Oil line which includes Argan Oil Repairing Shampoo & Conditioner, Repairing Deep Conditioner, and Shine Treatment. Let's take a look at what I thought. HASK Argan Oil Repairing Shampoo: "Infused with moisturizing argan oil, this shampoo penetrates the hair shaft, gently cleansing while it repairs damage and breakage, leaving even the most rebellious hair frizz-free, silky-soft and super glossy. It’s no wonder they call argan oil the “miracle oil”! Ideal for dry, damaged or color-treated hair, this shampoo’s lively scent will also refresh and uplift your senses" via HASKbeauty.com. If there was a hair product change I needed, the Argan Oil Repairing Shampoo totally made it a positive one. With a light, refreshing lemon scent, this shampoo aims at strengthening & restoring your locks. I was definitely shocked at how there was no slack in the lather department [sulfate is the chemical that makes your shampoo lather!] and the frizz-free outcome after styling. HASK Argan Oil Repairing Conditioner: "Infused with moisturizing argan oil, this conditioner penetrates the hair shaft, gently softening and detangling while protecting against damage and breakage, leaving even the most rebellious hair frizz-free, silky-soft and super glossy. It’s no wonder they call argan oil the “miracle oil”! Ideal for dry, damaged or color-treated hair, this conditioner’s lively scent will also refresh and uplift your senses" via HASKbeauty.com. Again, a perfect addition to any hair product change I needed. And a positive one! 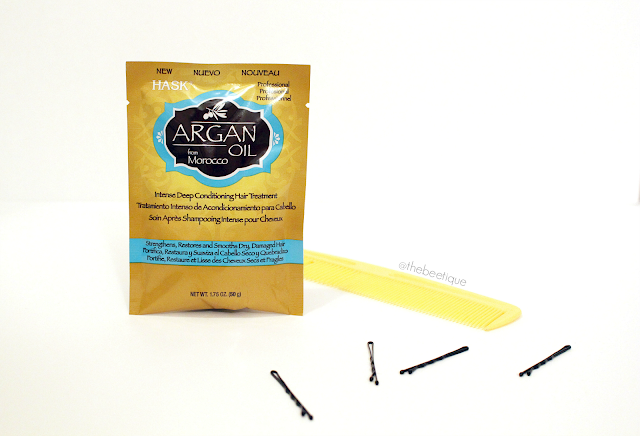 Just like the shampoo, the Argan Oil Repairing Conditioner is determined to strengthen & restore. Prior to my product switch, I started to notice how knotty my hair was whenever I'd go to rinse.... even after conditioning. Knotty hair = loss of hair = not cool at all. The conditioner left my hair so soft and silky that I wasn't sure if I completely rinsed or not. Huge adjustment to one's shower routine, but a good one! 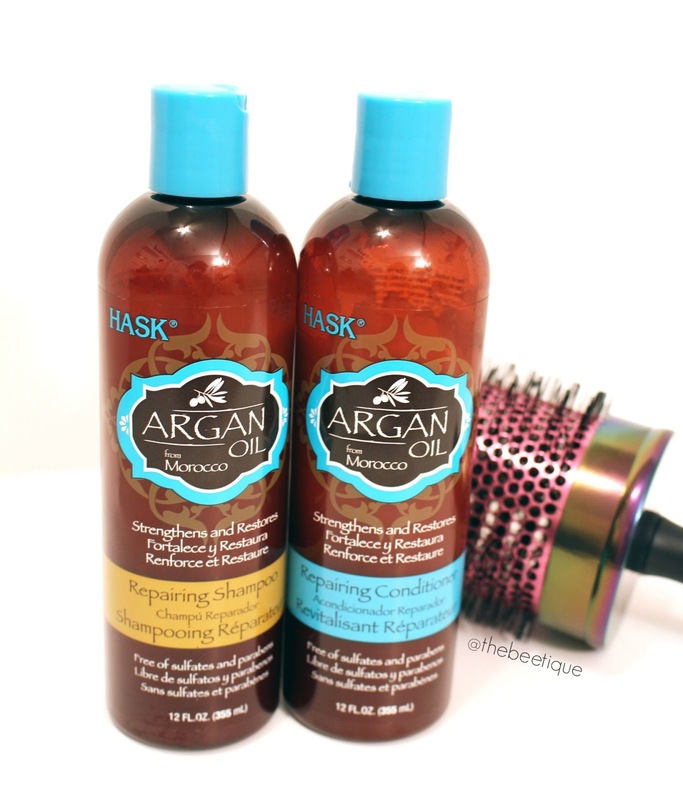 HASK Argan Oil Repairing Deep Conditioner: "HASK Argan Oil Intense Deep Conditioning Treatment with Keratin, is a super strengthening, hydrating treatment that will restore and smooth dry, damaged, chemically treated or over processed hair. Argan oil, unique to Morocco, is known for its high absorbing, penetrating and split end qualities while leaving even the most damaged hair soft and nourished for added moisture. Treat your hair with this nourishing deep conditioning treatment, formulated to bring life back into your luscious looking locks!" via HASKbeauty.com. I love the Argan Oil Repairing Deep Conditioner because just as our skin needs a special treatment every so often, so does our hair. Most of you know how much I love my DIY at home Coconut Oil Hair Treatment, but a whole night with your hair drenched in oil isn't always an ideal situation. Especially since you have to rinse it out, then shampoo twice before styling. With HASK's deep conditioner, you apply it like any other conditioner after shampooing, leave it in for 10 min while shaving your legs, rinse, and style like usual. Fresh & revived! HASK Argan Oil Repairing Shine Oil: "This lightweight, alcohol-free oil absorbs instantly to provide frizz-free shine without leaving an oily residue. Argan oil is rich in essential fatty acids and penetrates hair to restore shine and provide soft, silky results in dry, damaged hair. It’s no wonder they call argan oil the “miracle oil”! The lively scent will refresh and uplift your senses." via HASKbeauty.com. I'm a big fan of oils when it comes to hair product and a lot of people think I'm crazy. Oil in your hair = oily hair, right? No!! Maybe on your scalp, but your ends need them the most. and if your ends are frizzy and straw and not cooperating the way they once did, it's because it lacks oil. And with oil, comes shine! The Repairing Shine Oil can be used on both wet & dry hair for the softest finish on earth. Just dab a pea-sized amount into the palm of your hands, rub them together, and run your fingers through your ends. Style, and boom! Throughout the United States, HASK is now carried at over 12 bomb-a$$ retailers including three of my favorites: Harmon, Ulta, and Target. Check out the rest here. 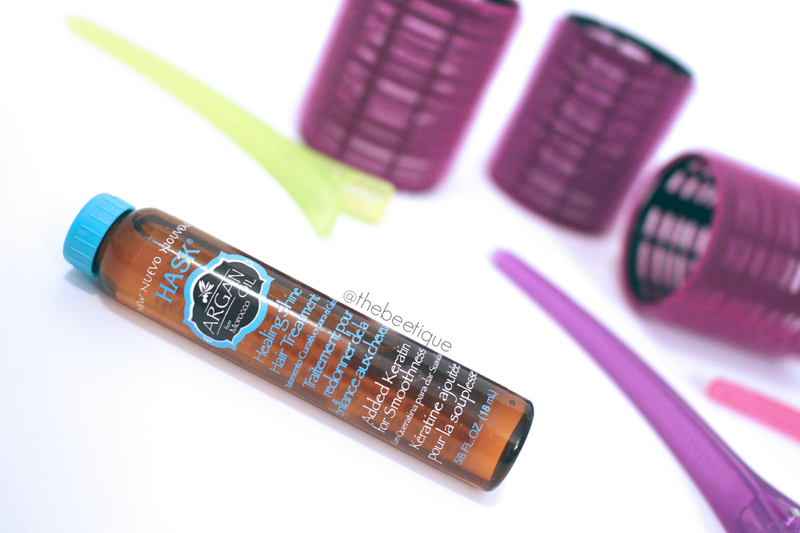 Have you tried any HASK hair care products? What'd ya think? LMK! 2 comments on "New Found Love: HASK // Argan Oil"
Its interesting to read about the Argon Oil and i hope it would be very useful. I am always worried for my hair and i ll try this oil once for a better treatment.